Late last week, my friend mentioned that she just borrowed a book from her library on her iPhone. I knew that I could borrow ebooks from my library. It never really worked for me because all the books were in PDF and I could only read them on my computer. 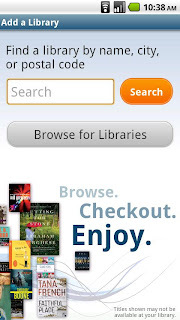 I realized that I haven’t explored my library’s ebook options since I got my Android phone. Low and behold, they have an Android app. My county library system utilizes Overdrive to handle all their electronic libraries. We can check out audiobooks as well as ebooks. Just like library books, I can keep them for a predetermined amount of time and they are automatically “returned” once time is up. So no overdue fees (thank goodness!). It’s all built into the DRM (digital rights management). Once I installed the Overdrive Media Console on my phone, I just searched for my local library. I could browse the books that were available to “borrow.” Ebooks and audiobooks were available through the app, but I only looked at the ebooks. I’m a much faster reader than a listener, so the pace of audiobooks frustrate me unless I’m on a road trip. The ebooks available through Overdrive are in ePub format. PDF formats are available through the web version. (Your library’s holdings may vary.) It was my first time reading a book in ePub. What makes ePub different is that the text can be formatted to fit your screen as well as text sizing. PDFs are much more finicky by nature. I had previously tried Aldiko Book Reader but it only accepts books I’ve purchased or downloaded myself. Too many steps for me. 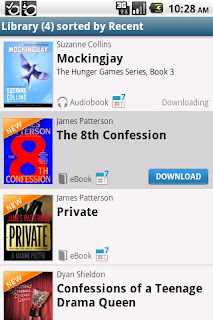 After searching for some books (which I found easier to browse on my laptop than my phone’s browser), I “checked it out.” When I logged into my library account through Overdrive, I could download the book to my phone. I chose Robopocalypse. There was a lot of hype about it at Book Expo America so I decided to give it a try. I found Overdrive really easy to use. Steps to download and read a book were minimal. Choosing which book I wanted to read took the longest. There are several text sizes to choose from. The default is medium. You can also change the background color to white (default), black or sepia. I switched my display to black since I do most of my ebook reading laying in bed with the toddler. My library has a 4 book limit and 2 week loan period. Yours might be different. I could also return books early if I was finished early or didn’t like the book, I could borrow another one. My library has a limited selection (about 300) of ePub books compared to the thousands of PDF formats. I’m sure that will change in the future. I can probably download other ePub books to my app as well. I fiinished Robopocalypse in 2 days, so now to find another book to read! You can download Overdrive Media Console via Market on your Android phone or on their Market website. It is also available on the iPhone as well. The app is free.